See that guy digging in the dirt, removing dead trees in the middle of Detroit? How did he end up there? His story starts with a middle-class upbringing in Dearborn. But as a youngster, Todd Mistor aspired to be a priest -- a shepherd of flocks, not a steward of trees. And it's a course he followed into adulthood. So where do the dead trees come? Mistor, 36, says it all makes perfect sense. Taking care of creation is a calling for him. And what better place to do it than Detroit, where he believes he truly belongs. Mistor is an urban forester, working for the city of Detroit for the past five years, in charge of the removal of dead trees that blight the cityscape. In his spare time, he works with the nonprofit The Greening of Detroit to plant trees in the strips of earth between the sidewalk and curb. There, he sees the future of the urban forest. “There are so many benefits from trees in an urban area," said Mistor. "There is the environmental benefit of cleaning the air, producing oxygen, and shading homes so it can reduce heating and cooling costs. The trees help mediate the flow that goes into the sewer system. Even as a young child, Mistor loved trees. He, along with his six siblings and other family members, planted trees on the family farm Up North. For eight years, the family would make the trip to Mayville to plant 1,000 seedlings, with the intent to grow a Christmas tree farm. Though the tree farm was never fully realized, the hard work paid off. Each blue spruce and red pine set the stage for his future life’s work. “It’s a feeling of accomplishment and satisfaction knowing that there is an impact that will be made by that," he said. "The planting of that tree will have a much broader environmental impact of producing oxygen, providing shade and a habitat for wildlife. It is part of a broader system,” he said. Don't expect, however, to see Mistor criss-crossing the state a la Johnny Appleseed. Mistor, it seems, hates to be out in the woods. “Todd doesn’t like roughing it,” said Olszewski, “neither do I. We very much prefer being in the city. He thinks trees are vital and important part of any city ecology. I mean it’s nice to walk down a tree-lined street in the summer in the shade." Mistor did not come to his leafy surroundings directly. He looked up to priests during his childhood. His family lived directly across the street from St. Alphonsus, his home parish. He attended Catholic grade and high school, where he volunteered at a food bank and soup kitchen. It was then that he learned about social justice -- the idea that everyone deserves an equal chance. He began to question life and the role he played in it. He carried the memory throughout his time at Michigan State, where he received a B.S. in forestry. Immediately after graduation, he entered Sacred Heart Seminary, after which he was ordained a priest. And for two years he served in a priestly role. But he finally decided his calling existed outside the religious life. He moved to the struggling city of Detroit, where he felt he could effect change. “The whole idea in understanding an urban system is the idea of building something good that works that is successful for everybody, where everybody has an opportunity," Mistor explained. "That is why I want to be a part of Detroit. That is why I wanted to move to the city when I left active ministry. It was appealing, the opportunity to work with my hands, the opportunity to use my background, my skills." 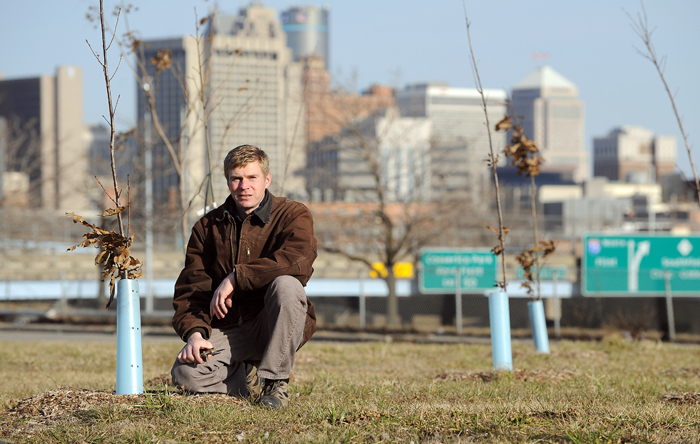 Each experience brought him closer to this moment to where he was finally convinced that his life’s purpose is to help reforest Detroit.